It’s fun to play in the dark. 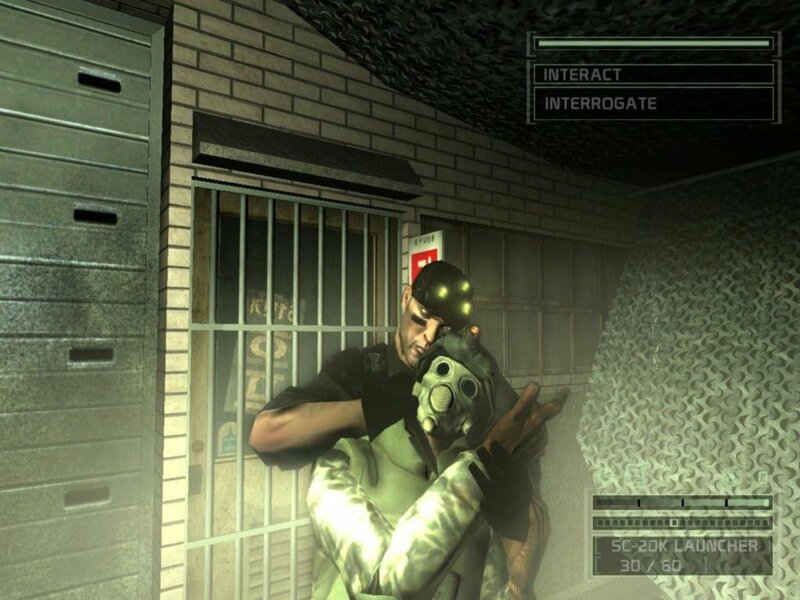 Sam Fisher has a new knife in Splinter Cell: Chaos Theory. It’s one of those Ginsu-like monsters that villains flash to look menacing in action movies, with an edge that’s sharp enough to cut moonlight and a blade so long that the super-commando could stick it through a moose. It also breaks locks, cuts makeshift doorways, and both coerces and silently ventilates bad guys. In short, you shouldn’t leave home without it. And it’s also a symbol to Ubisoft’s move to freer, more fluid gameplay. 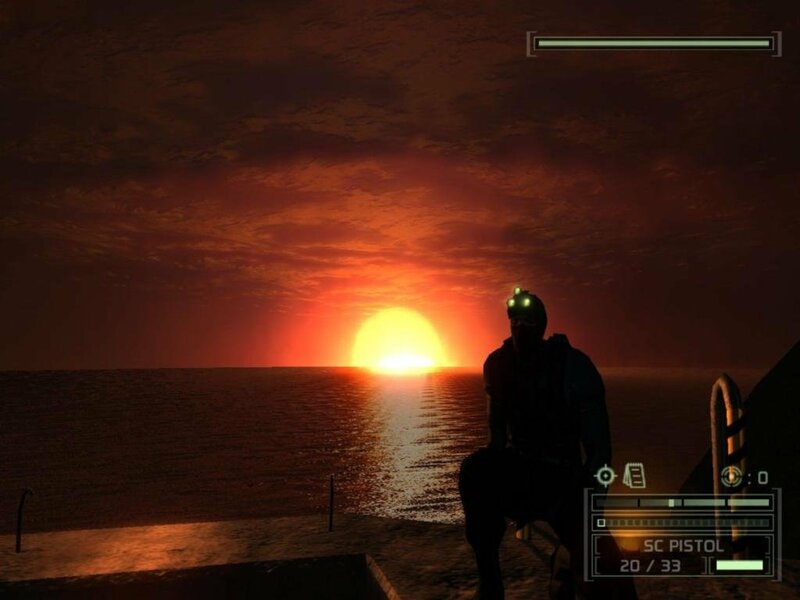 While you still do the usual first-person-sneaker shuffle, the linear design of the first two editions in the series has given way to go-anywhere levels that provide choices for players, and a wide-open co-op mini-campaign where you follow Sam’s exploits from afar. Saving the world, one surreptitious adventure at a time, is more engrossing and more realistic than ever. Elite anti-terrorist organization Third Echelon and the activities of its top operative are still more James Bond than anything that’s ever occurred in the real world. 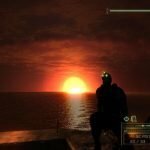 The storyline, however, hovers closer to authenticity than anything featured in the original Splinter Cell and its Pandora Tomorrow sequel. 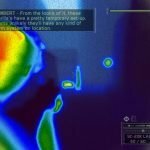 Tensions between China, Japan, and North Korea that could have been torn from today’s headlines power the plot, although the game takes a sci-fi turn with the introduction of a high-tech information espionage mess called the Masse Kernels and a pistol that disrupts electricity with an electromagnetic pulse. Top tier spy gadgetry, in other words. 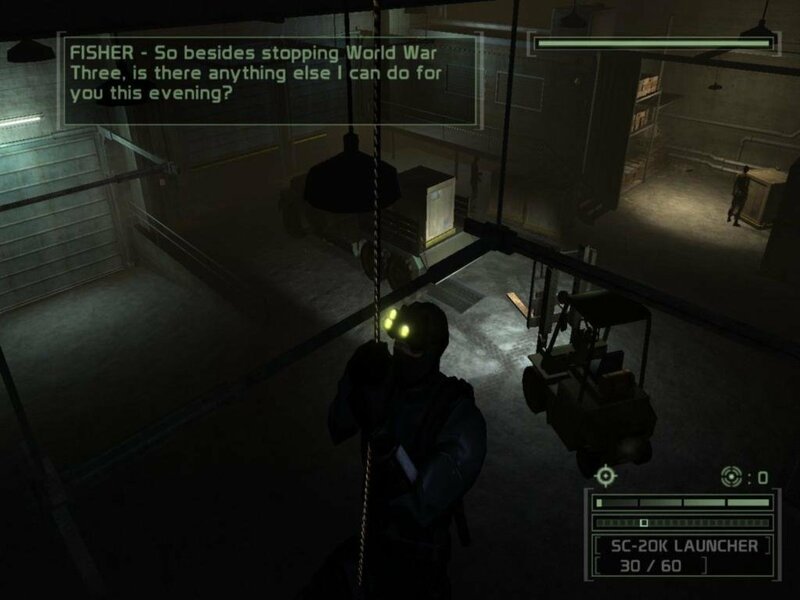 Yet suspension of disbelief has never been easier to realize in a Splinter Cell game. 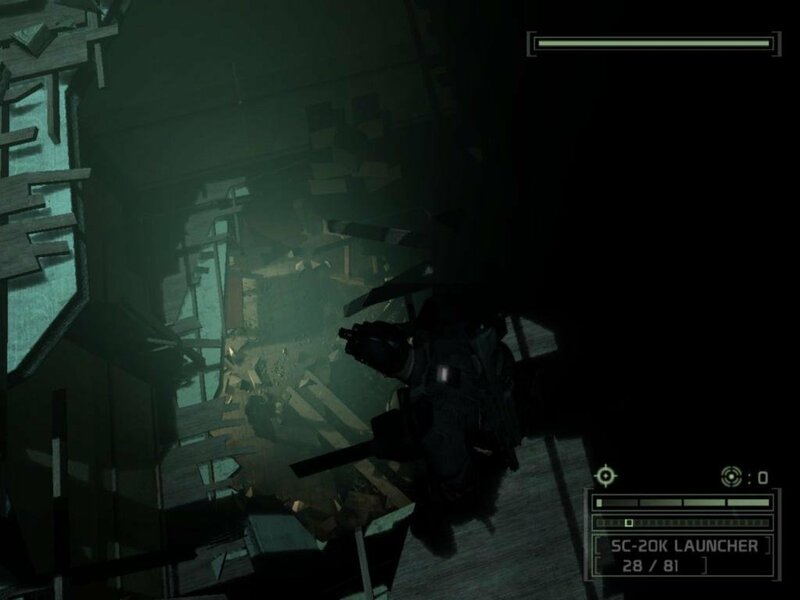 The biggest reason for this is open-ended, practical level design in the 10 solo missions. Locales are more authentic across the board, whether Sam is sneaking aboard a cargo ship in the Pacific, creeping through blacked-out penthouses in New York, pulling a dine-and-dash at a Hokkaido teahouse, or infiltrating a North Korean missile battery. The visuals are fantastic, with incredible architectural detail and rooms filled with so many accoutrements that they look like real living and working spaces. Levels are also stylish, with a water theme running throughout. 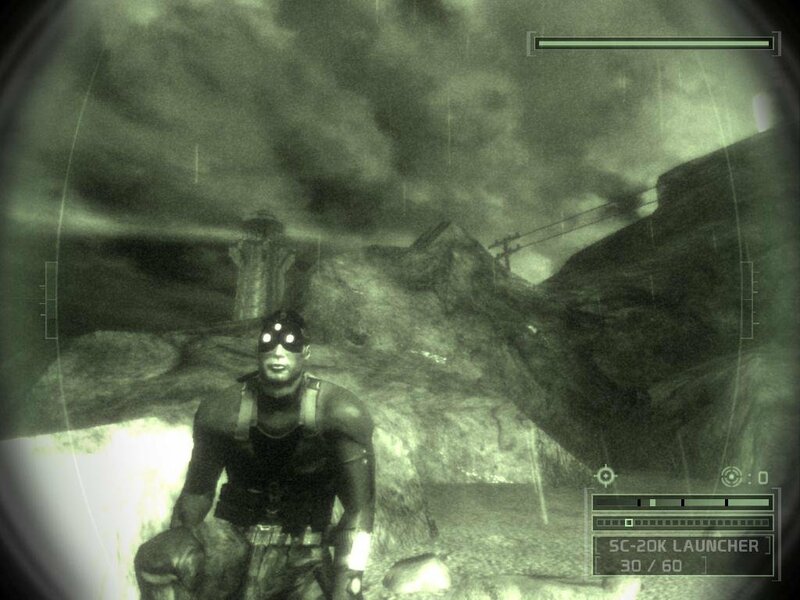 Rainy nights, streams, puddles, steam-belching runoff drains, and, um, urinating guards add a lot of moody atmosphere. Ubisoft’s decision to turn the game into a showcase for product placement is a little irritating, though. Every level has a sponsor, so expect AMD logos plastered intermittently. 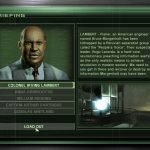 Where past Splinter Cells betrayed their Xbox origins with linear levels and objectives that left little room for improvisation, there isn’t much of the “can’t get there from here” philosophy in Chaos Theory. Missions no longer end if you trigger a specific number of alarms—although you can be punished with an influx of guards—which is handy because every mission encourages experimentation with multiple ways to both reach and complete goals. It seems like there’s always a direct road and a subtle one, leaving it up to you to decide brute force or subterfuge. Also, design changes give players the ability to determine how to approach the game as a whole. You can now customize Fisher’s equipment loadout, or pick from pre-selected gear packages designed to help you sneak or shoot through missions. You can now scrap all of that pesky sneaking and choke-holding for guns-a-blazing charges where shell casings fly out of your all-purpose SC-20K rifle like it’s a 90s action flick. 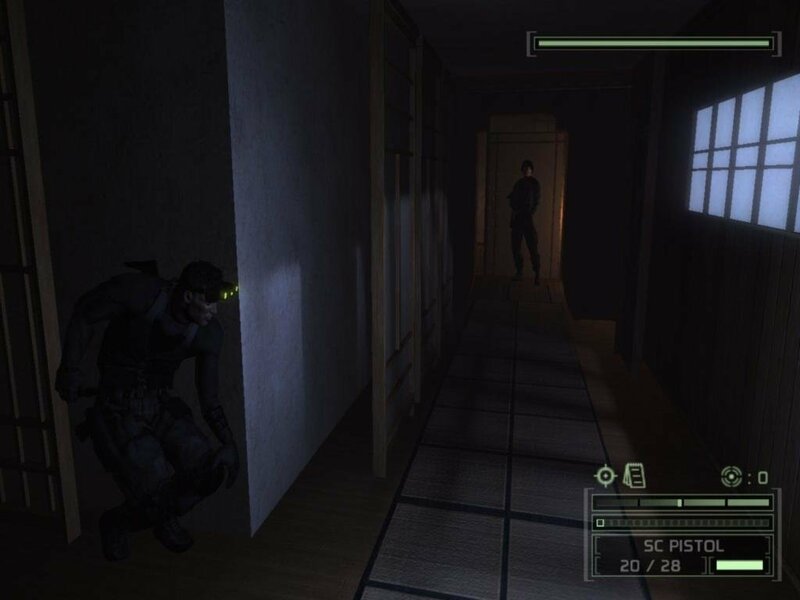 A loud shotgun that knocks enemies back half-a-dozen feet has even been added to the weapon’s optional attachments, letting you to let go of stealth. Blasting through the single-player campaign isn’t easy, though. 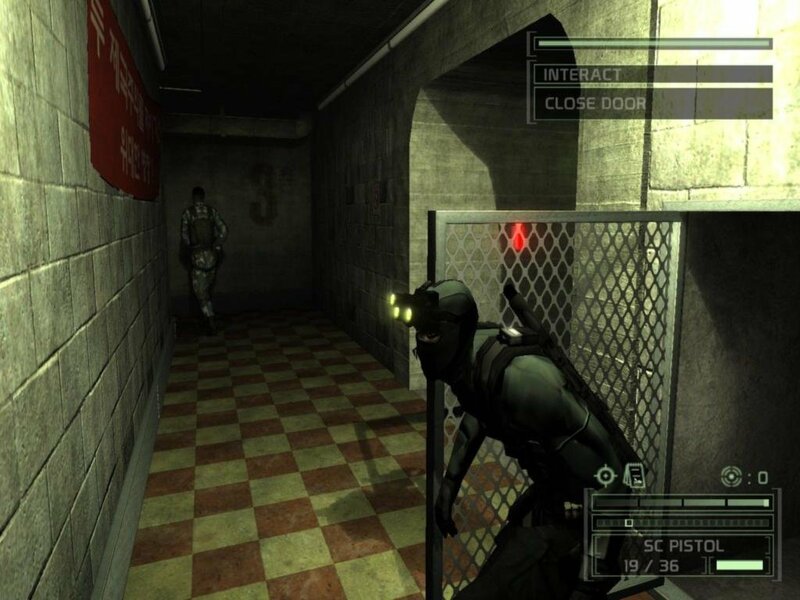 Enemy mercenaries must be cheap hires, because there are scores of them on every level. It’s extremely difficult to take them all out, because one or two well-placed shots still send Sam to the super-spy version of Boot Hill. Artificial intelligence has been juiced up so foes now stalk you in the shadows. Baddies light flares and scour darkened corners where any sensible commando would be hiding from heavily armed rent-a-goons. They also hunker down when under fire. 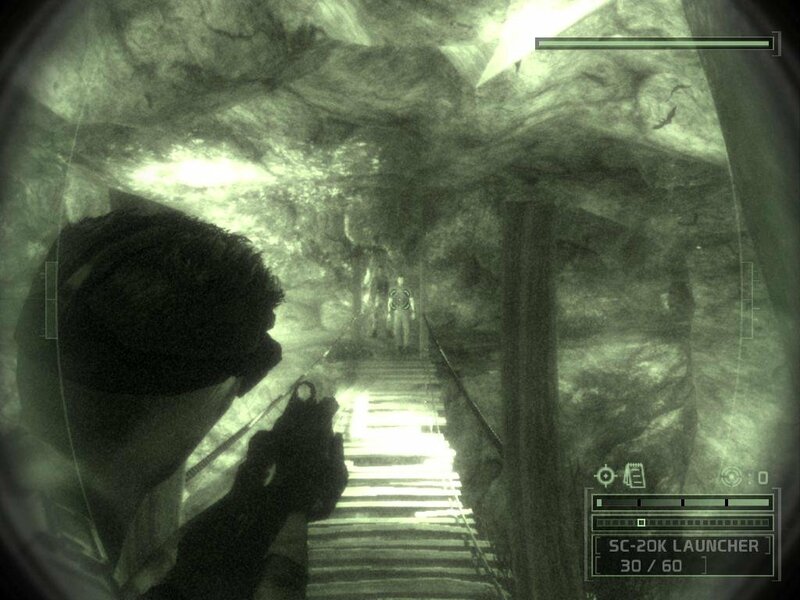 Pulling a Rambo means more than shooting everything that moves, because enemies often don’t move—they take cover after you’ve killed their buddies and wait for you to do something stupid. So it’s generally a good idea to tiptoe around and only open up with the budda-budda-budda stuff when caught in a tough spot. This is the best way to experience Chaos Theory, too, because Ubisoft has added some nifty accoutrements to make your shifty maneuvers more memorable. Most noteworthy is Sam’s previously lauded new best friend, the combat knife impressive enough to send Paul Hogan scurrying home to his dingoes and koala bears. And even though this blade has got the goods to win any “That’s a knife!” contest with a second-rate Australian actor, it also comes in handy when it’s necessary to slice a do-it-yourself doorway in a tent or smash a lock in a hurry. 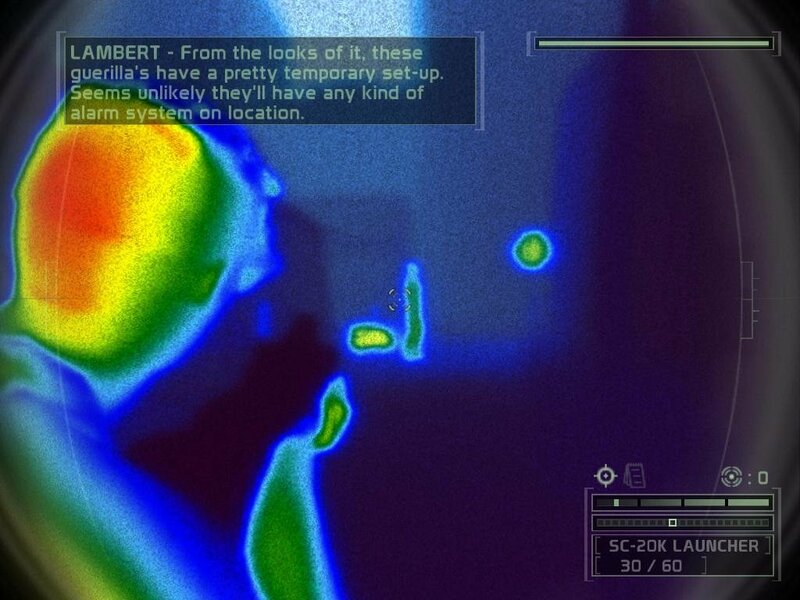 Gameplay is more fundamentally altered by the aforementioned Optically Channelled Potentiator (OCP), an attachment to Sam’s standard 5.7 pistol to not-so-literally shoot out the lights. 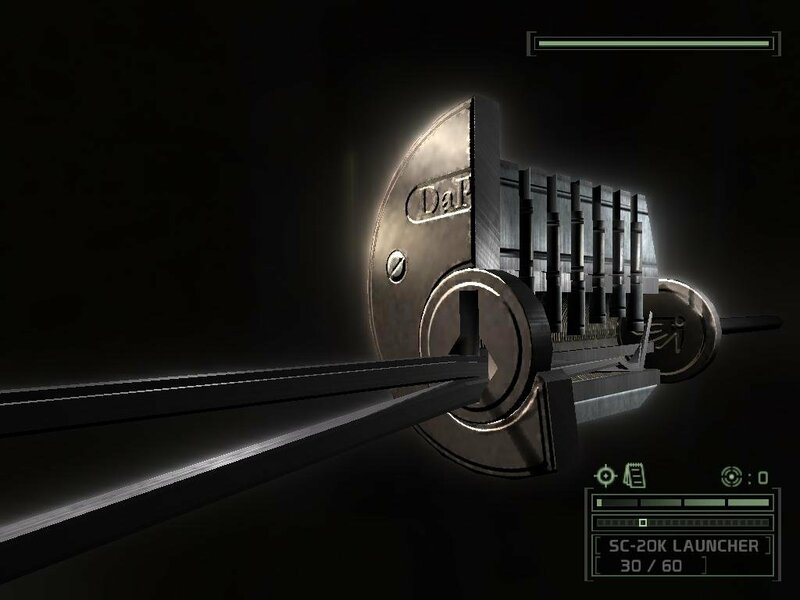 This device is something of a futuristic version of Garrett’s water arrows from the Thief series, in that you mostly use it to silently extinguish lights. The juice remains out for just a few seconds, but that’s usually enough time to slip past enemies. 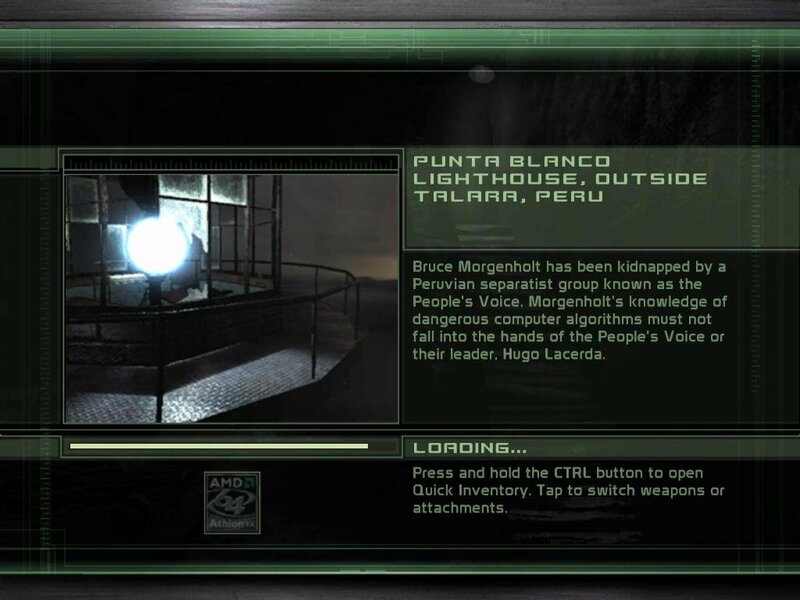 Also, the OCP can be used to disrupt most electrical devices in the game, including portable generators and computers. Playing havoc with a merc’s laptop is a great way to distract him from his guard duties. Multiplayer modes are something of a greatest hits package of all that was good in Pandora Tomorrow, with a slightly enhanced version of the “spies-versus-mercenaries” Versus game topping the bill. 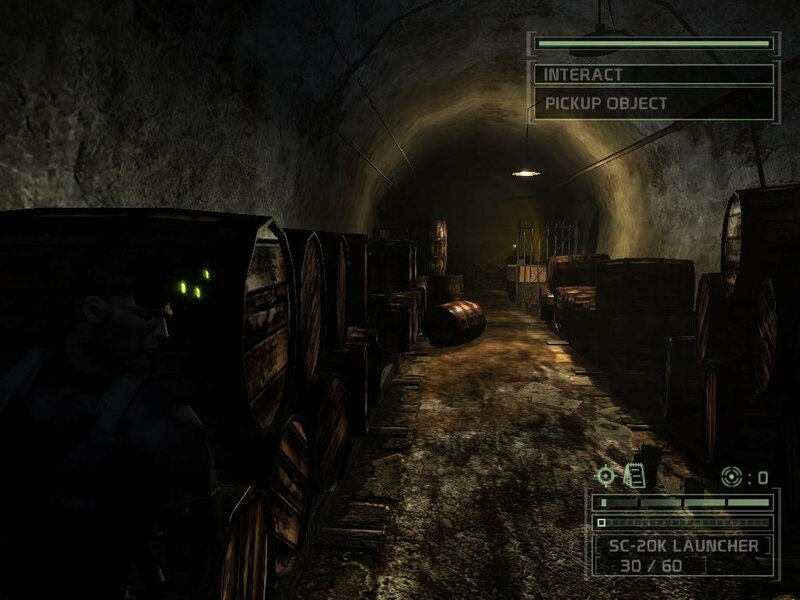 There is one key addition, however, in two-player co-op. This mode is the icing on the solo-campaign cake. It features a mini-campaign where you form a super-spy duo with a friend and tackle assignments blending the usual stalking and slaying with moves where players set up human ladders and launch one another across chasms. 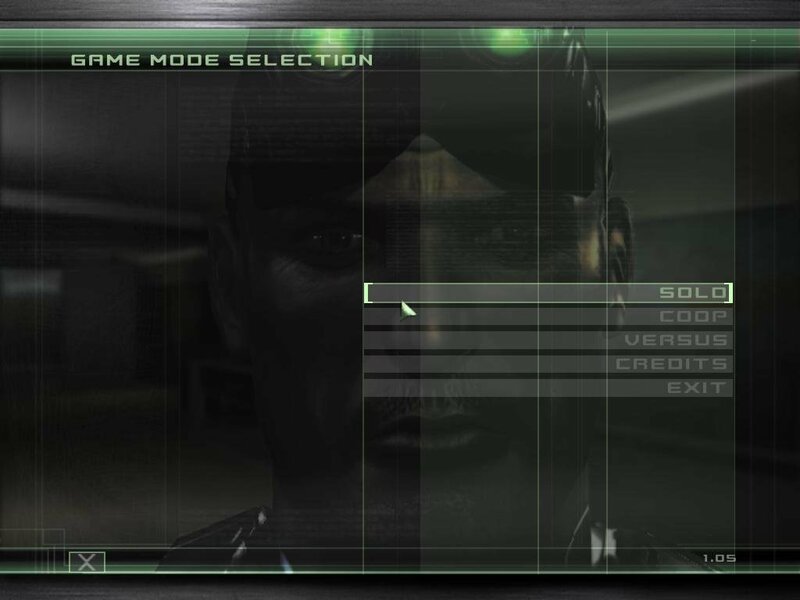 But while co-op is overall a pretty nifty variation on standard Splinter Cell action, Ubisoft obviously didn’t spend too much time developing this mode of play. 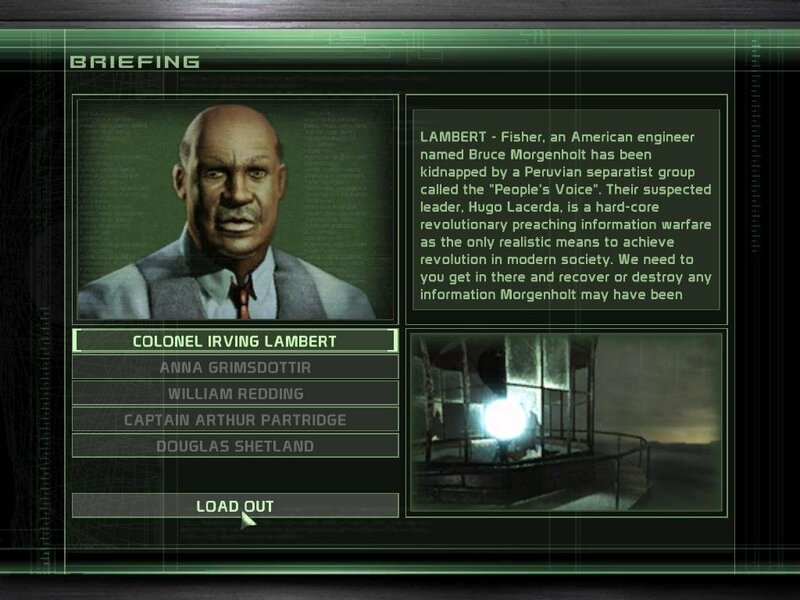 There are just four relatively brief co-op missions, and while they follow the events of the main campaign in an interesting fashion (you track Sam’s adventures for the most part), they lack the intricate design of the solo levels. 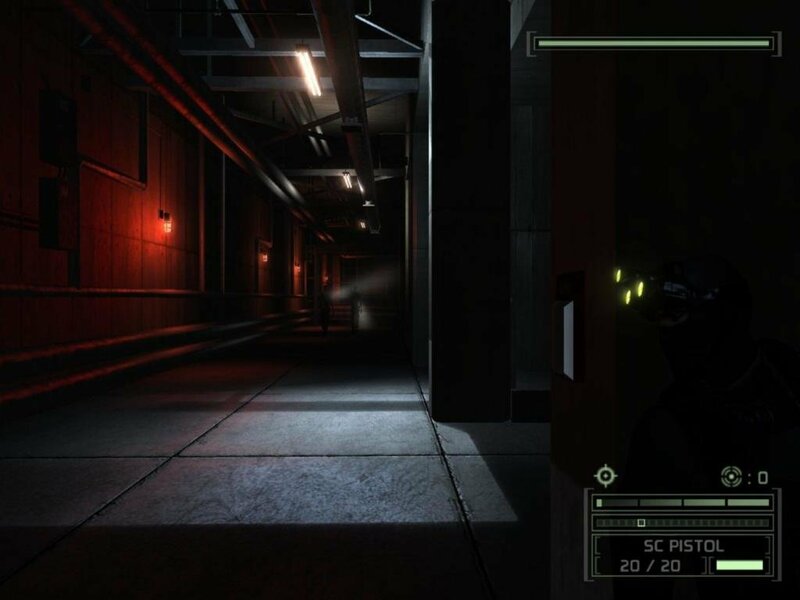 Experienced players can zip through the entire campaign in an evening. Also, communication is iffy. There is no automatic way of tracking where your partner is on the map, so a headset or a buddy playing within shouting distance on a LAN is an absolute must. 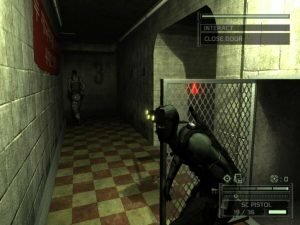 Even with the slight co-op disappointments, the only truly black mark against Splinter Cell: Chaos Theory is that it ruins its predecessors. 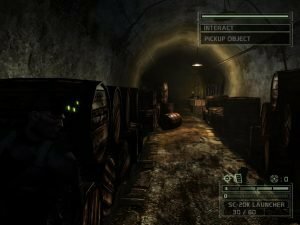 After playing this game, with its more realistic levels, its smarter baddies, its inventive co-op multiplayer, and its great big combat knife, there is no going back to the first Splinter Cell or Pandora Tomorrow.